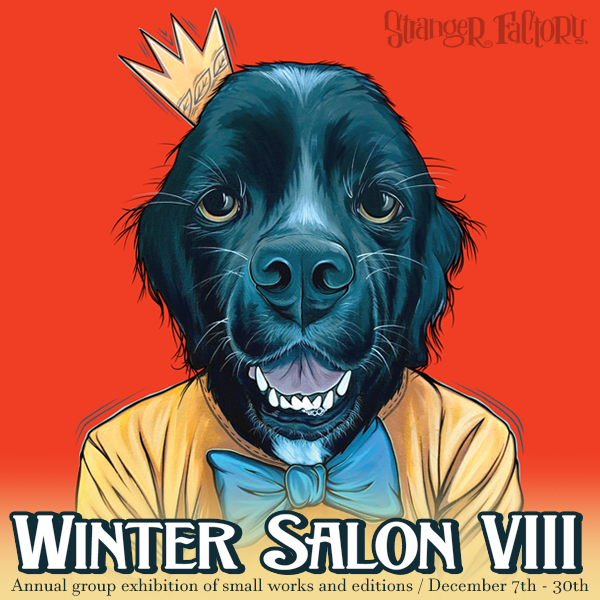 WINTER SALON VIII this December! Stranger Factory is pleased to present our eighth annual group winter exhibition! Winter Salon finishes the year with a bang! Our small works annual group show is an end of year celebration and one of our most exciting exhibitions, featuring new artwork from many local and international artists. 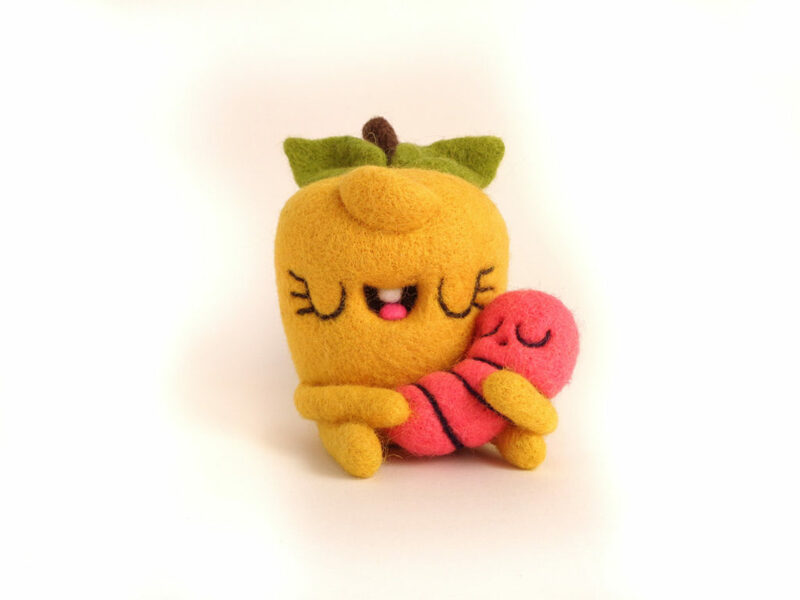 This year’s talented line up promises to provide a variety of enticing alternatives for the upcoming gift-giving season including original illustrations, paintings, sculptures, and plush! This year’s participating artists include: Allison Bamcat, Angela Oster, Brandt Peters, Bruce Parker, Cassia Harries, Creeptoons, David Santiago, Defective Pudding, droolwool, Fika Art, Genevieve Geer, Joe Scarano, Johnpaul Gutierrez, Junker Jane, Kaitlin Zeismer, Karl Deuble, Kathie Olivas, Katherine Walsh, Nora Thompson, Pretty.Weird, Sad Salesman, Sandi Ray Pierce, Stan Manoukian, Tim Lee and more! 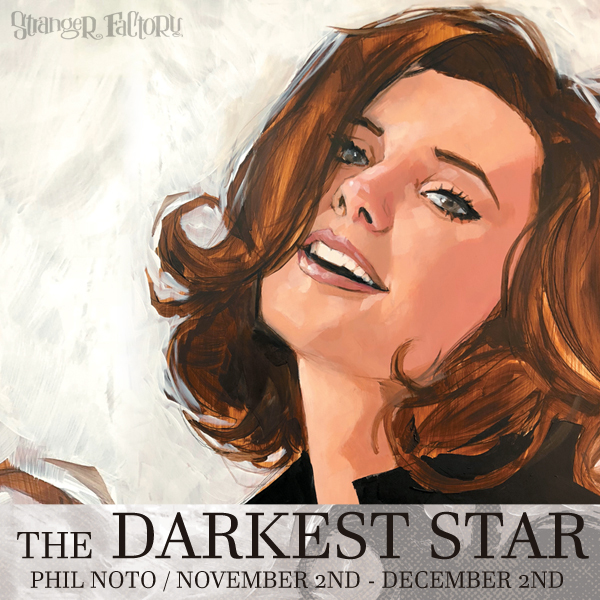 Phil Noto’s “THE DARKEST STAR” this November at Stranger Factory. Stranger Factory is pleased to present The Darkest Star, a solo exhibition in November from one of our most beloved multi-platform artists, Phil Noto! This show will be featuring Phil Noto’s signature style of painterly and abstracted dream-like portraits, juxtaposed with bold graphic elements and typography. Noto’s master paintings are portraits of future protagonists with secret pasts, drawing us further and further in to his continued narrative. Phil Noto is an Eisner nominated American painter, comic book/ concept artist who is known for his work on such titles as Black Widow, Jonah Hex, Uncanny X-Force,and most recently Star Wars (Chewbacca and Shattered Empire). After a 10 year career at Disney Feature Animation, he started to work full-time as an artist for Marvel, DC, Image Comics and Dark Horse, and as well, time in gaming working on such blockbuster hits such as Bioshock. Phil Noto has been a prominent featured artist at Stranger Factory since its opening in 2011. This is his 7th featured solo exhibition with the gallery. 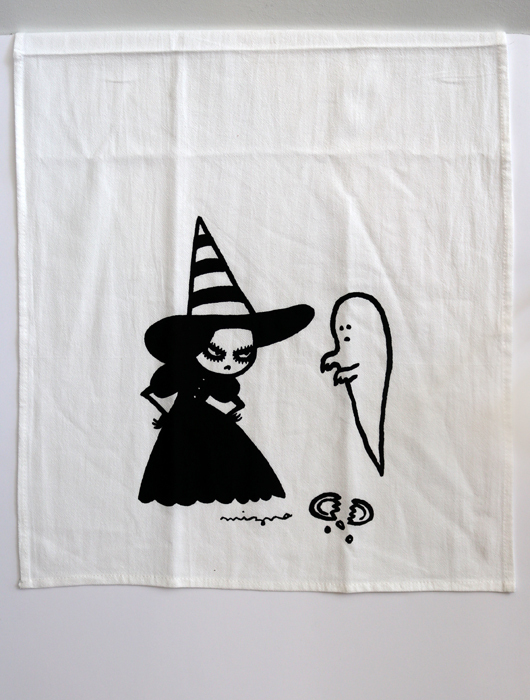 New tote and towel from Mizna Wada available now! 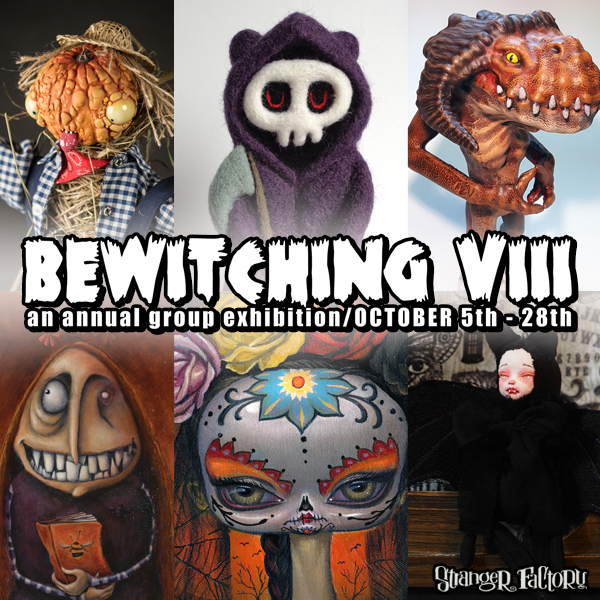 Stranger Factory is pleased to announce our Halloween group exhibition, Bewitching VIII in our main gallery! Bewitching is the annual Halloween group show featuring an eclectic group of artists creating their own personal versions of iconic Halloween-related imagery in a wide variety of styles and mediums. 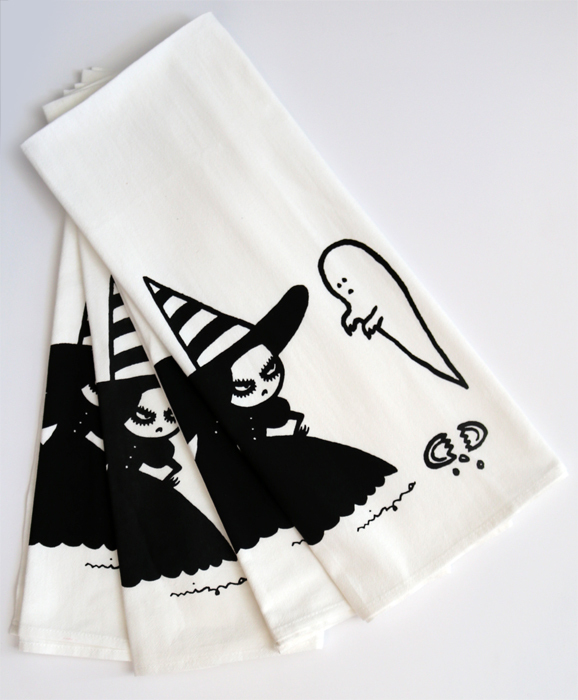 Halloween is an incredibly special holiday for Circus Posterus and Stranger Factory, and October is our favorite time of year. We hope you’ll join us for this celebration of all things dark and spooky! This years participating artists include: Bob Doucette, Brandt Peters, Bruce Parker, Danita Art, Defectivepudding, droolwool, El Dodo Albino, Eric Althin, Genevieve Geer, Jen Musatto, Joe Scarano, Karl Deuble, Katherine Walsh, Kathie Olivas, Katyushka Art Dolls, The Rots (Nora Thompson), Pantovola, Pretty.Weird, Sandi Ray Pierce, Shing Yin Khor, Tim Lee, Weston Brownlee, and more! 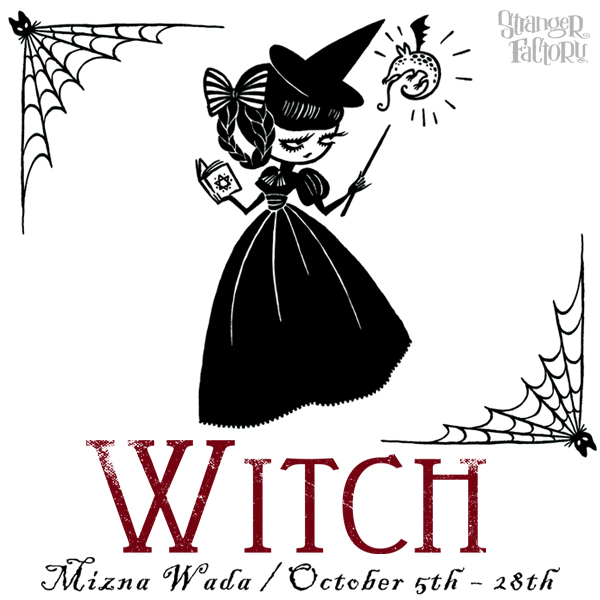 Inspired by Classical Horror, Mizna Wada’s Witch takes a play at traditional Halloween motifs. Simple and elegant, Witch explores the world of vampires, Frankenstein monsters, ghosts, creepy old castles, and of course, witches! 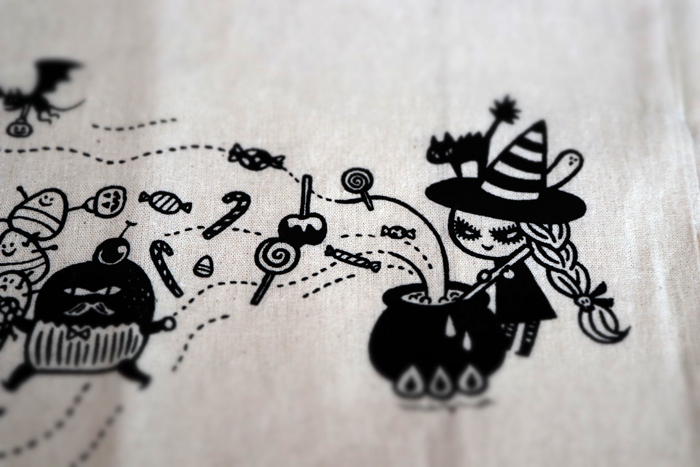 Mizna is a Japan-based illustrator. She was born in 1974 in Kumamoto, Japan. She always adored the horror comics and horror movies from her childhood. 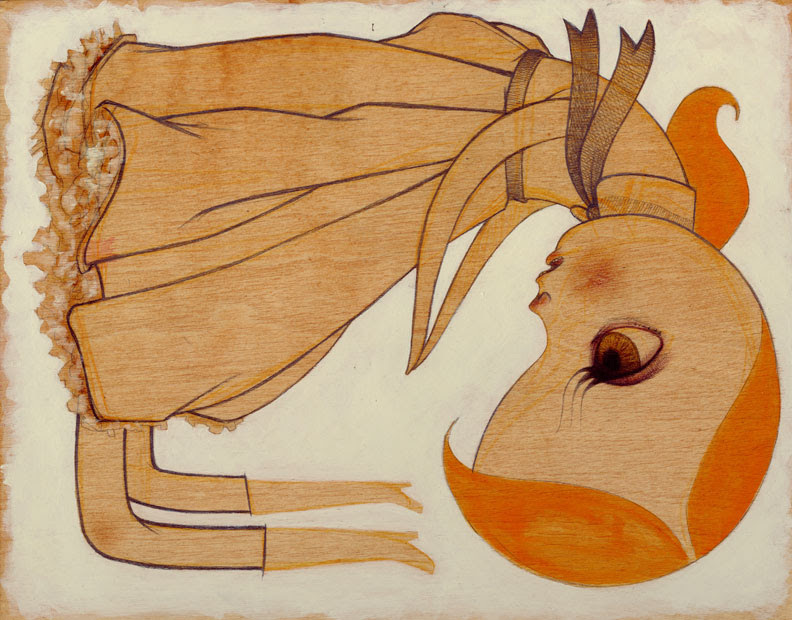 Her work features a variety of styles including drawing, painting, paper cut, print gocco, and cloth dolls… Through these processes, endearingly creepy yet cute girls are materialized! 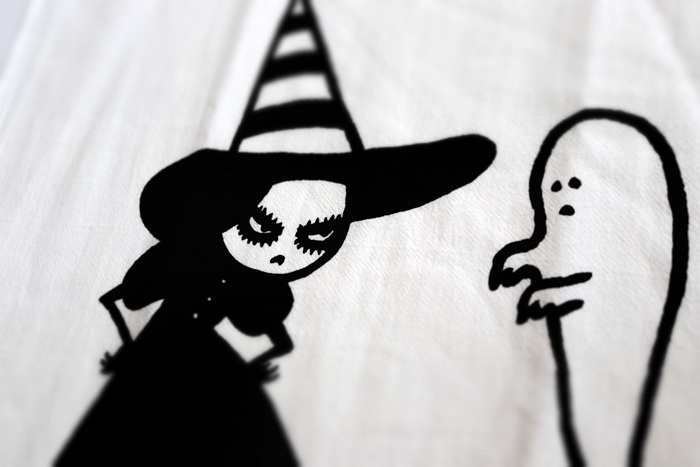 September at Stranger Factory with Creeptoons, Fika Art, Sumrow, and Stephan Webb! 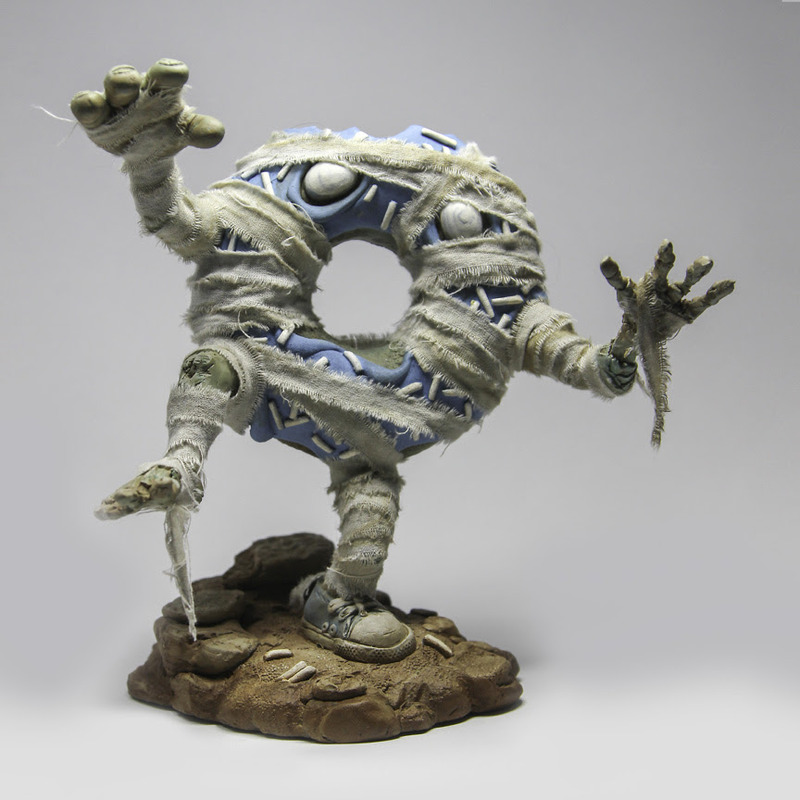 Creeptoons is the emerging creature brand by Florida based artist Matt Duncan. His 2d illustrative works begin as automatic drawings which develop as big strokes of drippy landscape and ink blotches that transform into dark and mischievous characters hoping to add chaos and misfortune to his apocalyptic landscapes. 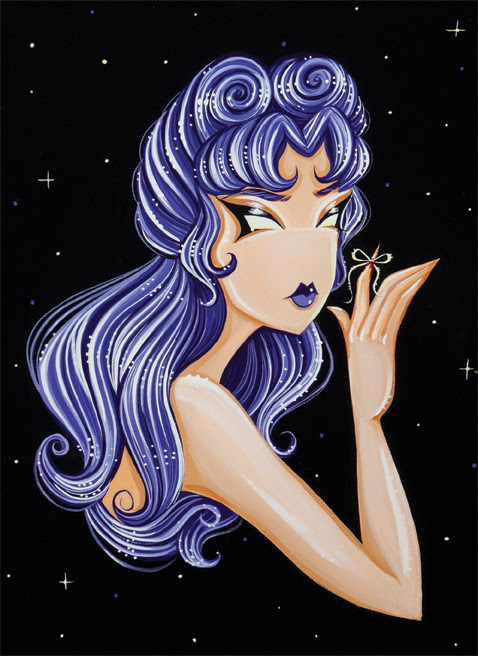 Fika Art is a the illustrated brand of emerging artist Stefani Rabideaux. Her colorful 2d works combine elements of darkness and isolation with vivid contrasting tones that are nostalgic of vintage illustration. Her delicate female characters evoke hope and optimism in dark times. 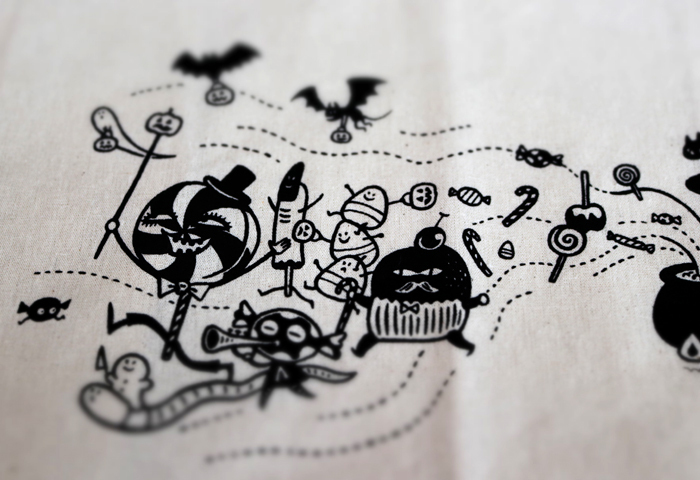 Dawn of the Doughnuts is a show filled with spooks and sweets. Sumrow joins us for his first feature exhibition, bringing along his army of Mr. Jimmies, the Undead Doughnuts, to thrill and fill the gallery with sprinkles and terror. John Sumrow is an Albuquerque based illustrator. His focus is with fantasy and science fiction. He spent almost two decades as a graphic designer in the higher education industry, switching gears in 2009 to to focus more on his first loves: painting and illustration. In Fractured Minds, Stephan Webb explores the inner workings of the human psyche and the forces that are imposed on an individual. What affects the behavior and characteristics of an individual? 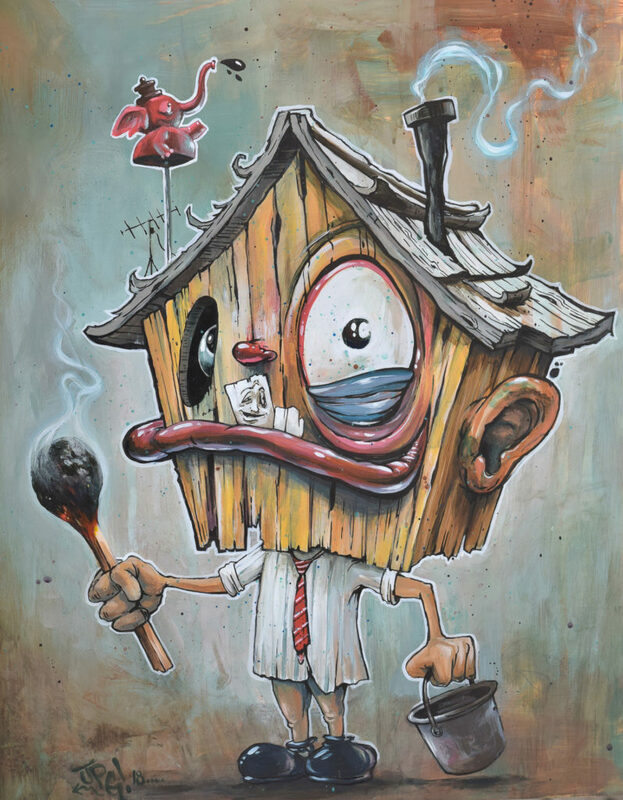 Join Stranger Factory as Webb tries to investigate the mind by displaying various figurative and expressive forms, as well as geometric elements that produce a surreal composition of the human figure, revealing the inner psyche. Webb, a local Albuquerque favorite, melds biology themes with intricately cast bronze pieces to create meticulously detailed pieces of art. 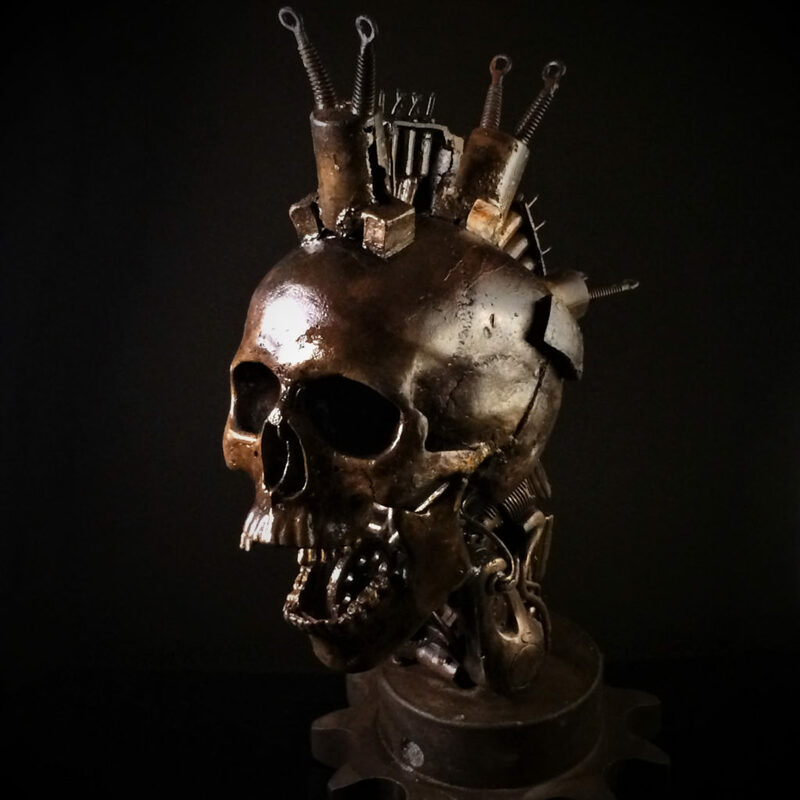 His degree in biology and love for metal working create a thought-provoking narrative that explores evolution, psychology, and process in an expression that leaves viewers intrigued. All three exhibitions are free and open to the public. 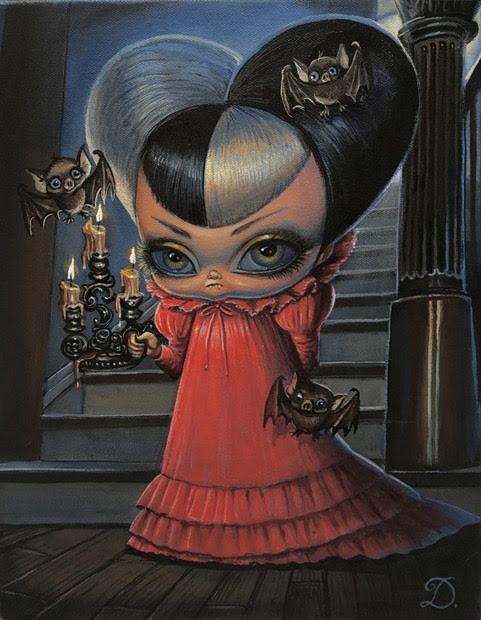 Kathie Olivas and Bob Doucette this August at Stranger Factory! Solo exhibition of new work by Bob Doucette! 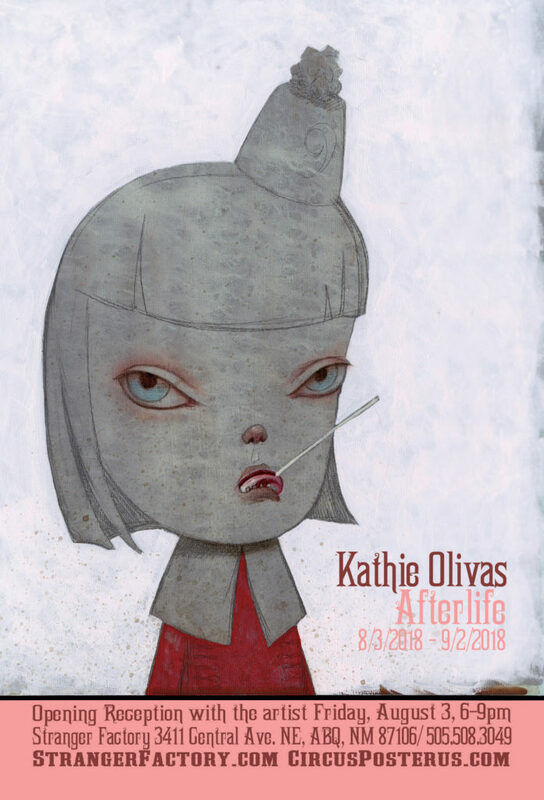 Stranger Factory is proud to present AFTERLIFE, a solo show by artist, Kathie Olivas! Kathie Olivas is an internationally exhibited multi-media artist from Albuquerque, New Mexico. Her work explores society’s insatiable desire to assign ‘cuteness’ as a measure for innocence and acceptance; to sooth our inability to accept our discomfort with the unknown. A dark blend of early American portraiture set in post apocalyptic times, Kathie’s mixed media paintings and hand made “toys” are a satirical look at how fear affects our sense of reality. Her characters are meant to evoke a nostalgic reaction that reflects isolation, fear, and an uncertainty, yet they also act as empowered alter egos. Her abstracted cartoon style, reminiscent of vintage story book illustrations and iconic advertising mascots, is meant to disarm our fear of the “other.” While these characters explore their new lonely worlds, they double as our narrators. They guide us through their reality as they experience it and yet, even in their company, we are granted no reassurance. 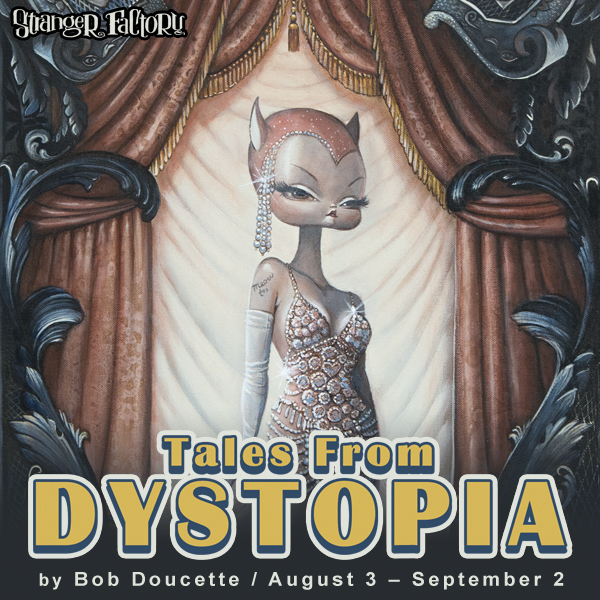 Stranger Factory is proud to present TALES FROM DYSTOPIA, a solo show by artist, Bob Doucette! As we are living in a new time, people everywhere seem to be highly stressed out over the state of the government and the state of the environment. Bob Doucette is generally a very positive and empathetic person and strives to find the upside to any problem even when experiencing an overall pain in the world. He hopes his work will help relieve some stress, bring a smile to people’s faces to help them forget their troubles for a few minutes; but sometimes, the darkness creeps in when everything in the world points to a Dystopian now. 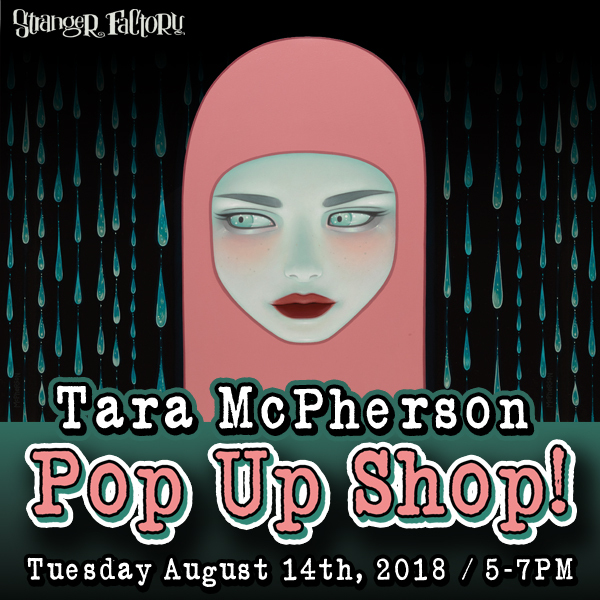 Tara McPherson Pop Up Shop at Stranger Factory this August! Mark your calendars! August 14th is gonna be killer! Tara McPherson and The Cotton Candy Machine are Poppin’ Up in Albuquerque, New Mexico at Stranger Factory! Swing by to meet Tara. 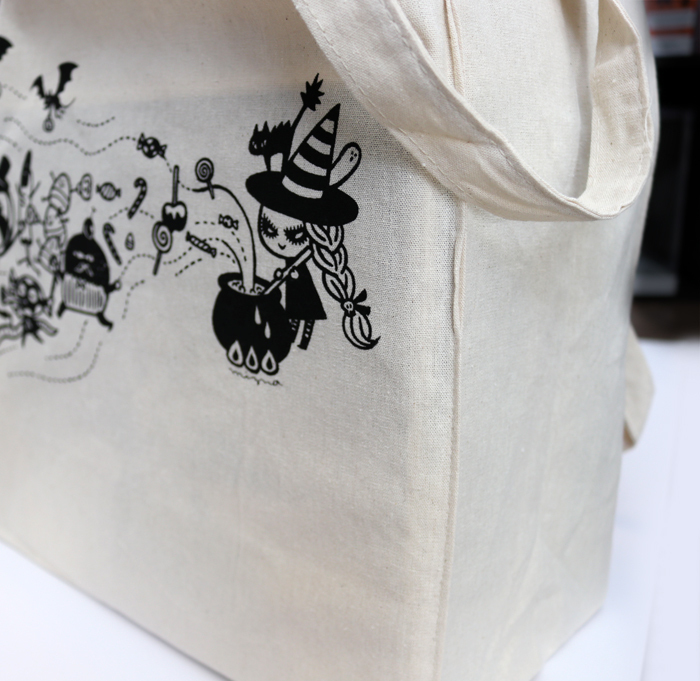 Don’t miss this rare opportunity to shop her traveling selection of goods and merch including rare prints, art toys, books and more! 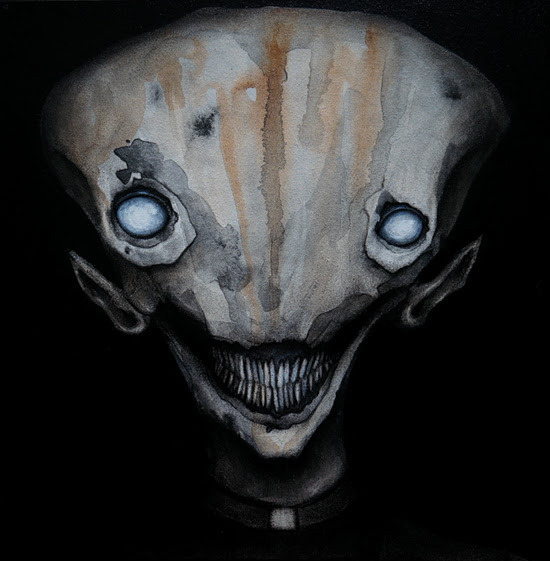 Stranger Factory is proud to present NEW BEST FRIENDS, a group show curated by our very own local artist, Karl Deuble! Karl is a screen printer and musician living in Albuquerque, New Mexico. He received his Bachelor of Arts in Fine Arts from the University of New Mexico in 2006. He grew up in Belen, NM before moving to Albuquerque to pursue his Fine Arts degree. Inspired by street art, cartoons, music, and cats, Karl uses screen printing, spray paint, acrylic and ink to create his style of characters. As his first curated show at Stranger Factory, NEW BEST FRIENDS brings new and returning artists who inspire Karl and his vision. This show brings a fun flavor to Stranger Factory as it invokes bright colors and imagery inspired by 80’s cartoons, music and street art. Join us as we tour fun graphics and playful illustrations! Over ten artists inlcude: Karl Dueble, Patt Kelley, Elena Cabitza, Santos Shelton, Bruce Parker, Thom Glick, Helen Li, Christa Dippel, J.W. Butts, Madelen Foss, and Chuck Chair. 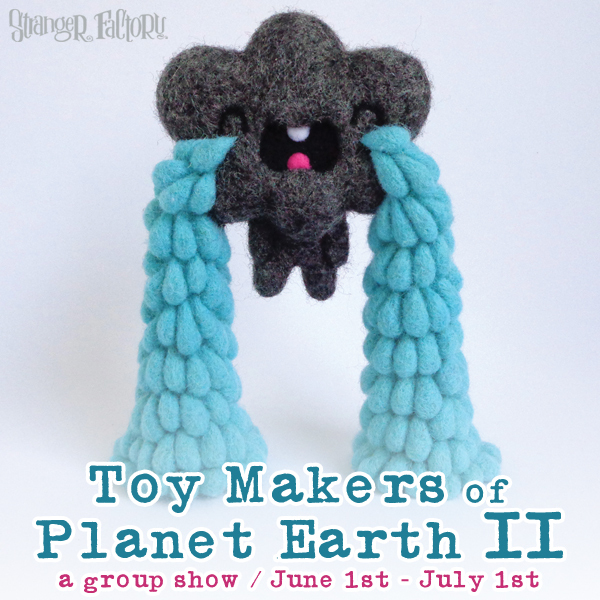 Circus Posterus and Stranger Factory are proud to present our upcoming toy art group exhibition, “Toy Makers of Planet Earth” opening this June. 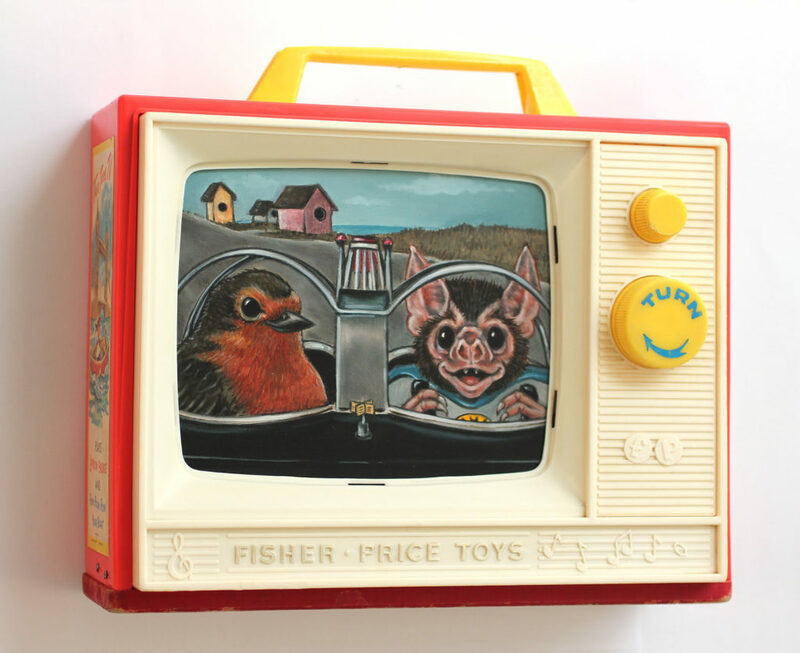 This invitational art exhibition will feature top independent contemporary toy artists, narrative artists inspired by toys, character makers, and independent toy companies from all over the world under one roof at Stranger Factory Gallery. Ken Keirns is a Midwestern oil painter. After spending the last decade living in Chicago and California,he recently settled in Colorado where he paints full time and looks forward to the winter. While his primary medium is oil, he also enjoys creating sculptures and mixed-media pieces. His subject matter includes female portraiture and anthropomorphic creatures interlaced with personal experiences, dreams, and the occasional bad pun. Ken’s formal education is in graphic design and, while he has taken a few formal painting classes, is mostly self-taught. 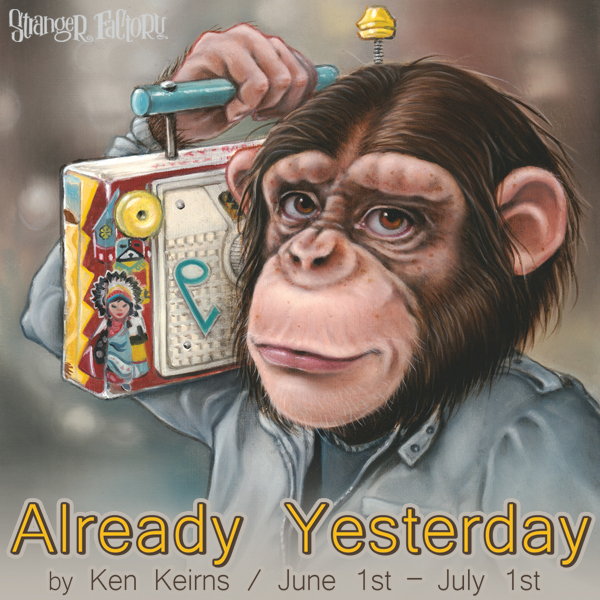 Ken’s artwork has been acquired by collectors across the U.S., Europe and Asia, and has been featured in publications including Spectrum, Catapult, and Hi-Fructose. Bai Chu’s army has infiltrated and overwhelmed the land. Despite his small stature, he remains a brilliant strategist and commander, and he has created an unstoppable force. The people live in fear, wondering when they will hear the ominous sounds of marching boots and clanking armor. Day after day, reports come of Bai Chu’s forces descending upon their unsuspecting villages, draining fruits dry and wreaking havoc among their communities. 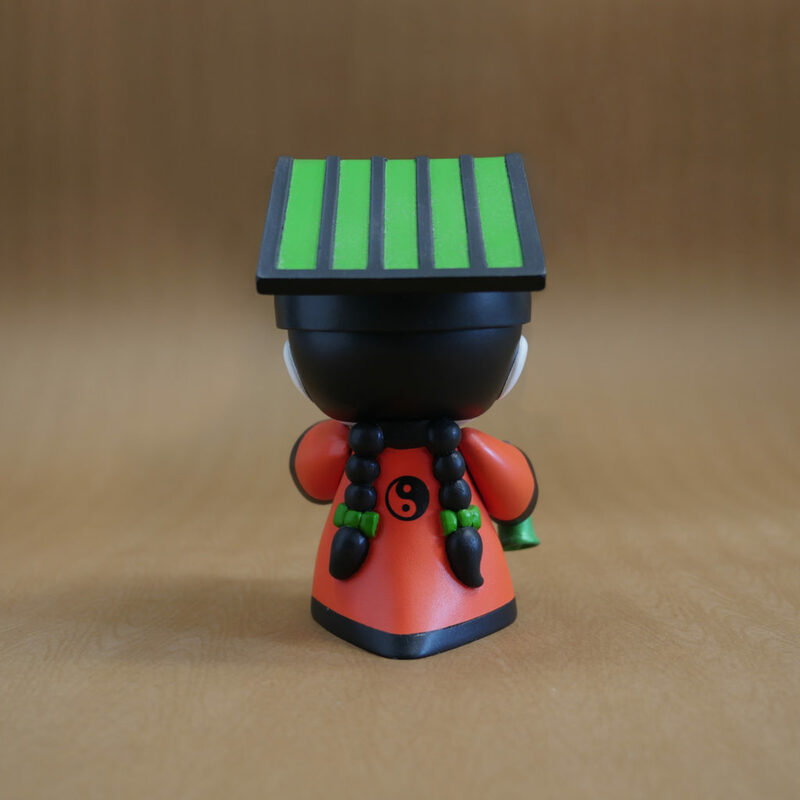 Upon hearing this distressing news, Bai Lan, the normally docile priestess and shaman, has decided to venture out of her temple to stop Bai Chu. Bai Chu and Bai Lan were once childhood sweethearts, and she knew him before he became a power-hungry general, before he ran into the vengeful Diwata who gave him his current diminutive form. 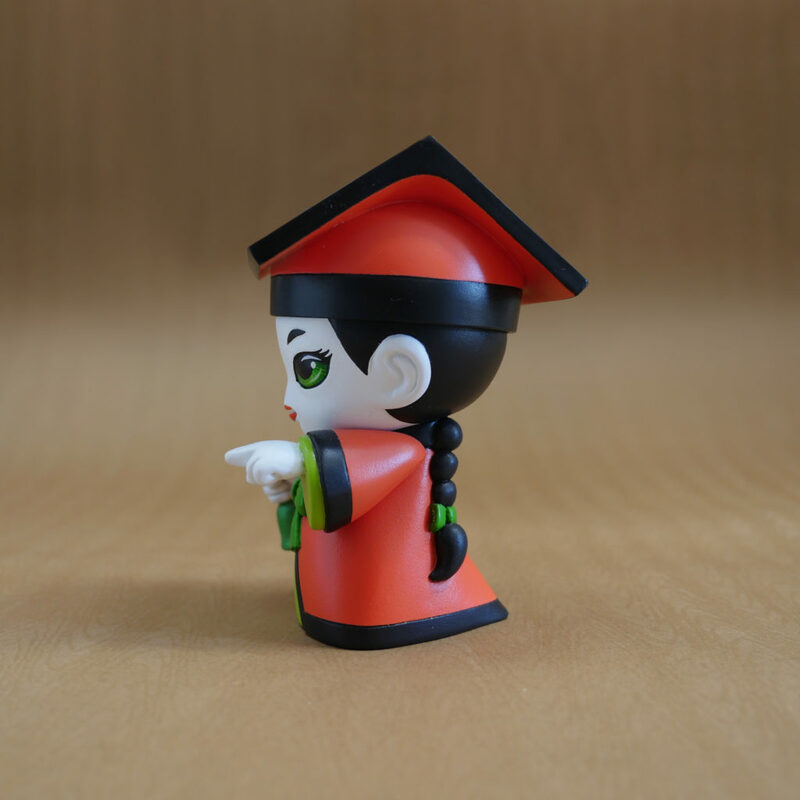 A scholarly pacifist, Bai Lan believes in balance and harmony as taught in her temple. She communes with the spirits and with Mother Nature to sense disturbances in Her equilibrium. Bai Lan, gifted with a sharp intellect and a keen sense of intuition, is an excellent tracker. Her years of study and research make her a naturally skilled investigator. Day by day she makes her way closer to Bai Chu, tracking his movements, figuring out his next move. Upon finding a ravaged field whose crop of blood oranges have been turned into withered husks, Bai Lan picks one up and devises a plan. 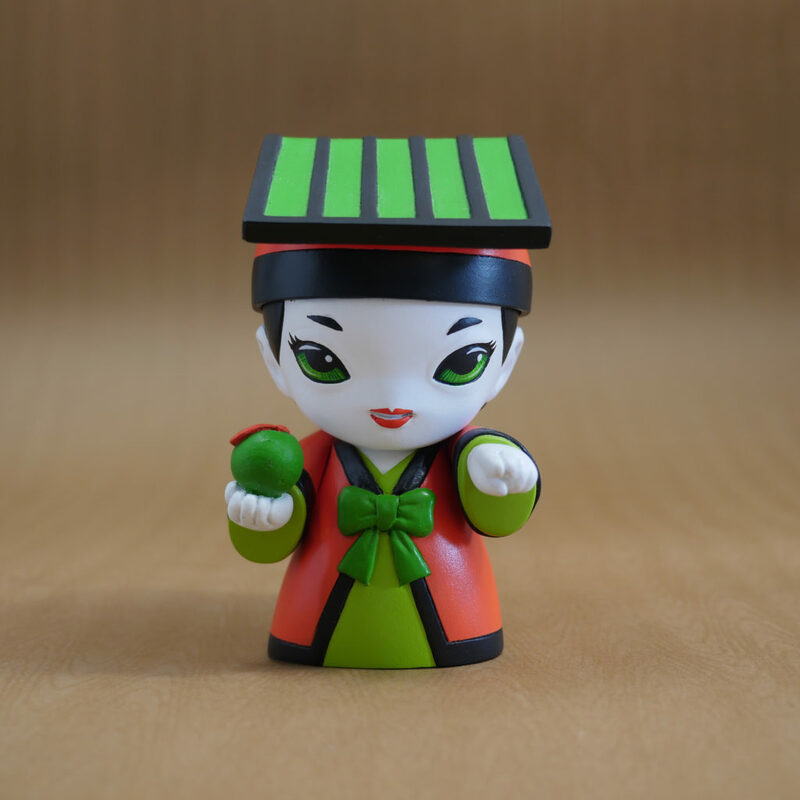 When they finally meet, will Bai Chu recognize his childhood sweetheart? Or will he see his worst enemy yet?